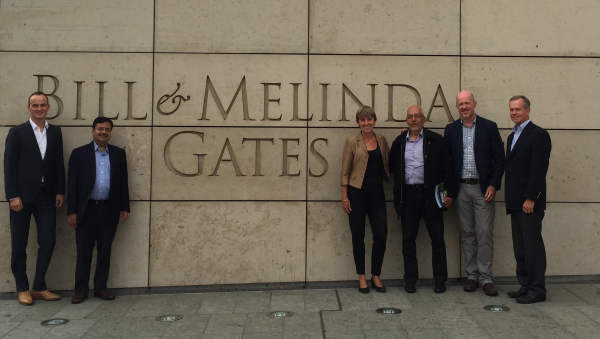 A delegation of the Access to Seeds Foundation was invited by the Bill & Melinda Gates Foundation to give an update on progress in developing the first Access to Seeds Index. The Bill & Melinda Gates Foundation is one of the funders of the initiative. From left to right on the photo: Ido Verhagen (Executive Director), Anil Jain (Supervisory Board), Coosje Hoogendoorn (Head of Research), Constantino Casasbuenas (Supervisory Board), Walter de Boef (Program Officer Bill & Melinda Gates Foundation) and Dennis Byron (Supervisory Board).